The string changing instructions at the bottom of my HD FAQ page now has pictures to illustrate the process! 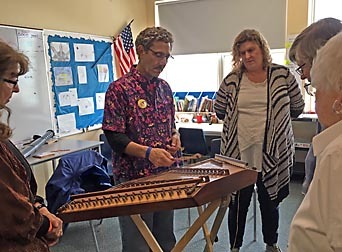 I frequently lead workshops at dulcimer festivals in the northeast across the US and offer private dulcimer lessons to students from my house in Marlborough, MA and over the internet via Skype. 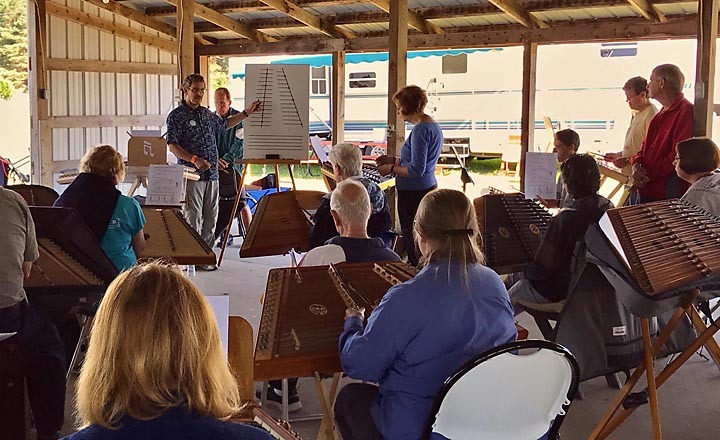 Each spring and fall I hold a week-long Hammered Dulcimer Chord Camp workshop that attracts HD players from across the country. 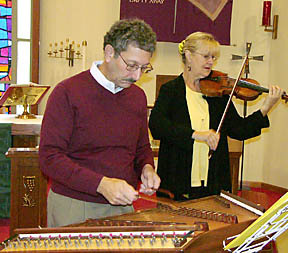 A 4 octave Cloud Nine 17/16/8 chromatic dulcimer (shown right) built in 1997 by Michael Allen. In 2012 it was refurbished with new strings, new internal bracing rods, and dampers. After years of playing with an externally mounted Pickup-The-World pickup, while the soundboard was removed for the refurbishment Michael installed new internally mounted Pickup-The-World stereo pickups for me (which sound great, btw). And thanks to Scott Freeman's experiments I also changed the lower courses to wound strings for a fuller sound on the very low notes. This is my primary instrument for dances, jams, and some concerts. In December 2016 I received a beautiful new 4.5 octave Jerry Read Smith Concertmaster 2/19/18/9 dulcimer. It too is chromatic, has dampers and internal stereo pickups. I traded in a darker stained ConcertMaster I was playing for this one which has a different color (natural) and type of soundboard (variable gradient), upgraded internal bracing, enhanced bass response, builder-installed Schatten stereo pickups (plus Pickup-the-World stereo pickups I installed), filligree corner scrollwork, and abalone accents on the rosettes. Compared to my Cloud Nine this dulcimer has a more classical dulcimer sound and overtones which I find more suitable for solo work. It also has additional high keys/notes, and has the super-bass bridge more conveniently (for me) on the right side. 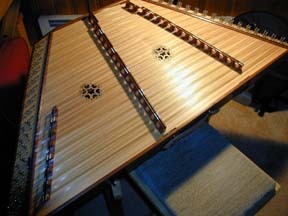 I play this dulcimer for weddings, most concerts, and recordings. Previous instruments I've owned include an R.L. Tack Pro*3, and Dusty Strings D500B and D10 models. For over 20 years I've provided enchanting hammered dulcimer music for wedding ceremonies and receptions at churches and wedding venues all over New England. 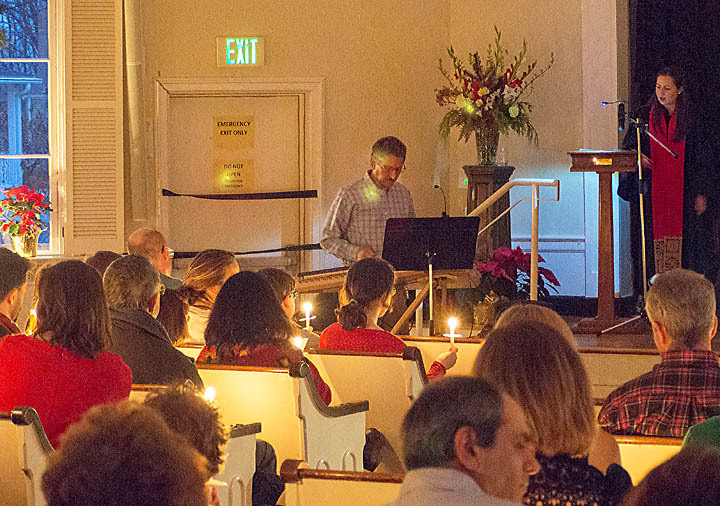 I've performed both indoors and outdoors, for large and small events, for services of all denominations, and for both traditional and themed events (such as a colonial themed wedding where everyone was in colonial garb). Typically I play background music during the pre-ceremony seating, a piece for the bridal party processional, another piece for the bride's processional, and then energetic joyous music for the recessional and while your guests are exiting the venue. 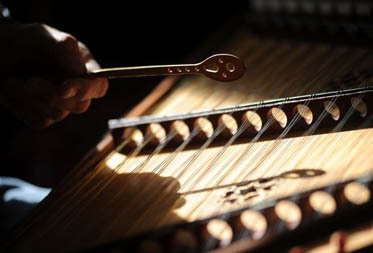 For the processionals you get to choose from a variety of traditional and contemporary pieces I've arranged for the hammered dulcimer - I can provide you with a website of my recordings you can listen to to make your choices. If you like I can also provide music for additional parts of your service such as a candlelighting ceremony or a quiet musical interlude. For newlyweds wishing to have a contra dance for their families and guests after the meal, I can provide a band and caller. This is a great way to get the families and guests up on their feet and interacting with each other in a fun activity that everyone can participate in. No prior dance experience is necessary. 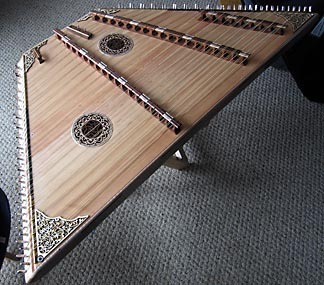 Use the Contact menu selection at the top of this page to send me an email if you are interested in having hammered dulcimer music for your wedding, reception, church service or other ceremony. I'm happy to answer any questions you might have about my music, local venues, and wedding ceremonies in general. I began contra dancing in the late 1980s. While at a dance festival I took a break from dancing and sat down next to the band that had a hammered dulcimer, fiddle and piano. 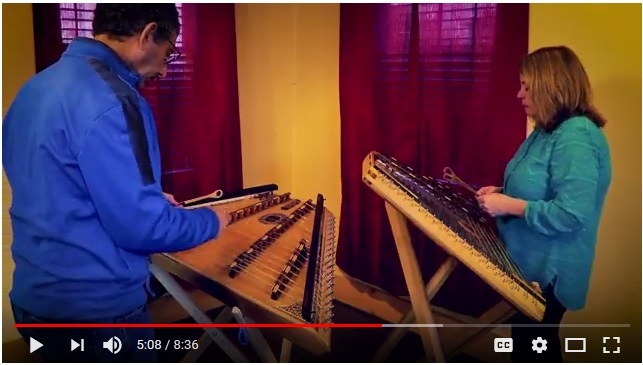 Although I had seen them in bands before, this was the first time I really "heard" a hammered dulcimer and I loved the interplay of its sound with the other two instruments. On the ride home the public radio station I was listening to played the entire Bill Spence Hammered Dulcimer recording. I took this as a sign! When I got home I bought a 12/11 instrument and several instruction books that turned out to be of little help. As luck would have it a few weeks later I went to a local dance where the band that evening was Lucille Reilly playing the whole dance, just her on dulcimer with a piano. I was impressed. I bought Lucille's book and used it to teach myself how to play. With a few tunes under my belt I started going to local dances that welcomed sitin musicians, and where I began to develop my dance repertoire. Eventually I was able to repay the kindness shown me by becoming the musical director of one of those dances, the CDSS monthly dance in Cambridge, MA. In the mid 1990s I started, and then each month for 14 years organized and played at the nearby Northboro Contra Dance in Northboro, MA. Now run by the dancers I'm happy to say that the dance is still going strong, and I look forward to performing there several times a season. Over the years I've been in several bands, and am currently a member of Wild Card (with Vince O'Donnell on fiddle, Robin Kynoch on whistles and button accordion, and Susan Creighton on piano). 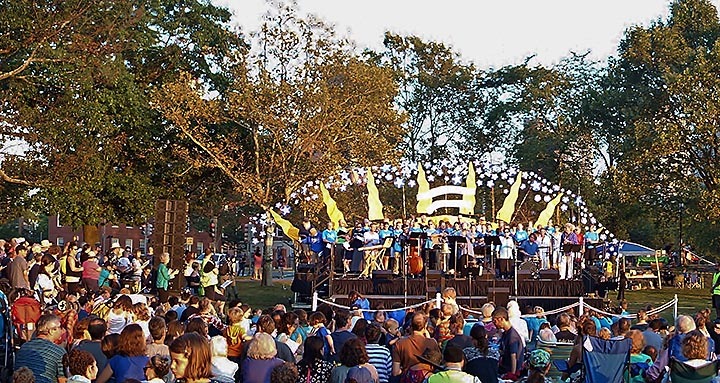 We regularly perform at Massachusetts, Connecticut and New Hampshire dances and are frequent performers at NEFFA (the New England Folk Festival). Check out my Schedule page to see if I'll be performing near you, and stop by and say hello. To inquire about booking me or Wild Card for your event please send me an email via the Contact link in the menu at the top of this page.